She was born a commoner, but Diana Spencer was far from common. In 1981, the world watched in total fascination as this beautiful kindergarten teacher married Prince Charles, heir to the British Throne, to become Diana, Princess of Wales. Together, they had 2 sons, William and Harry. Naturally shy, Diana overcame many obstacles - including her very public divorce in 1996 - and did so with a charm and grace that captured the hearts of everyone. In 1997, the entire world mourned as Lady Diana died in a tragic accident. She will always be remembered as the People's Princess, beloved by all. 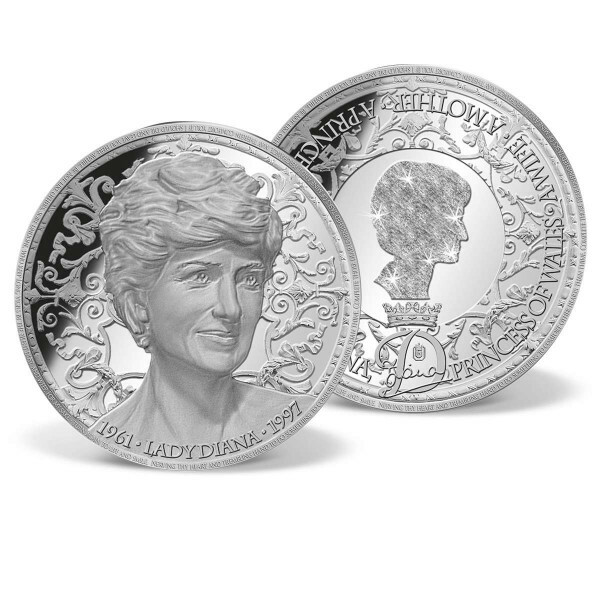 American Mint proudly presents a very limited release of this official coin specially minted to celebrate the life and legacy of Lady Diana. A massive 2.56" in diameter, this magnificent coincontains 5 ounces of solid .999 pure silver! Minted to the highest quality "Proof" standard, it features a beautifully engraved portrait of Diana on the obverse. The reverse sparkles with her silhouette profile accented with a stunning diamond-dust effect. Available exclusively from American Mint, this solid silver coin is limited to only 500 editions worldwide. The edge of each coin is individually numbered and comes with a matching numbered Certificate of Authenticity.